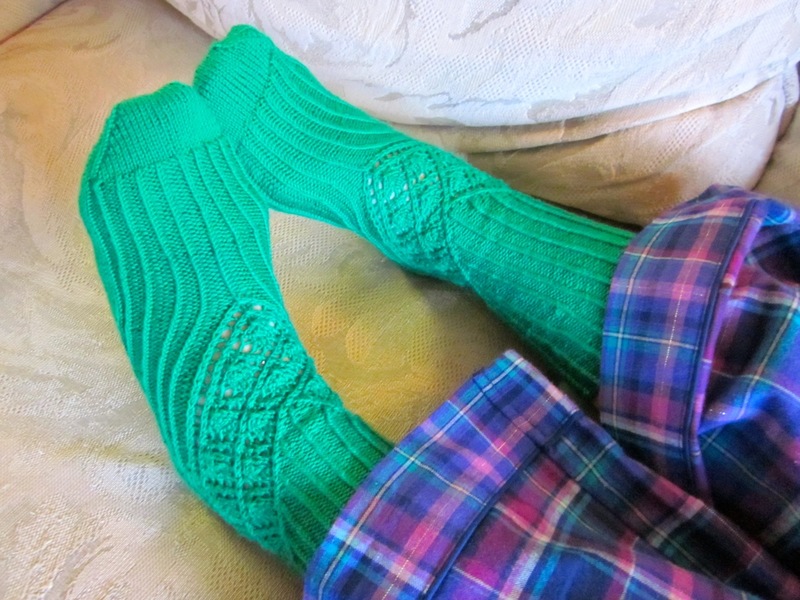 Lisa and I started knitting these socks together back in March, when I was in the mood for bright emerald green because of St. Patrick’s Day — but the colorway is actually called “Christmas Green,” so I guess it’s fitting that I finally got around to finishing them in the holiday season. The yarn is Cascade Heritage, which retails at about $11 for a 400+ yard skein and is an excellent sock yarn for the price, soft and stretchy, with a wide color palette of true solids good for showing off lacework. It was also the yarn called for by the pattern, and since the price was so right I figured I’d go for it. 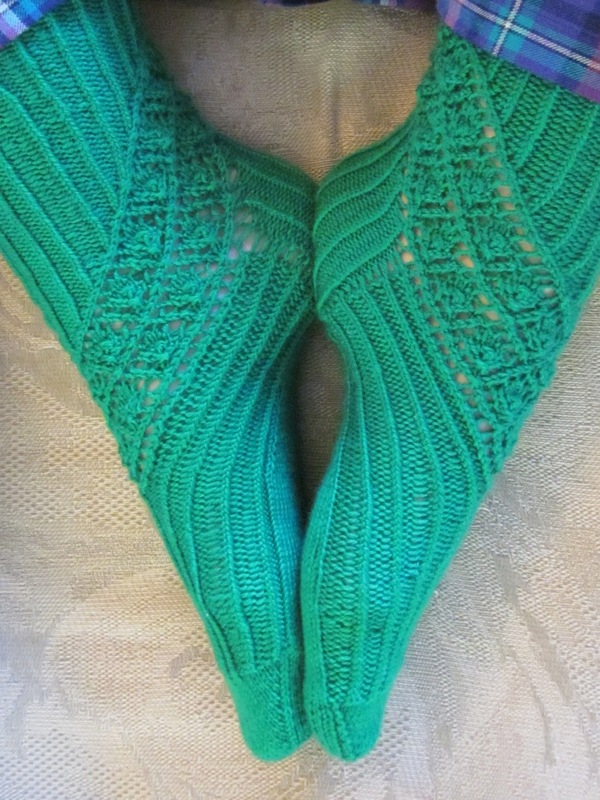 The pattern is Cusp by Cookie A. Lisa and I selected it since we both have copies of Knit.Sock.Love. that we wanted to get our money’s worth from. I don’t know about you, but I definitely have some pattern books that I’ve knit literally nothing from — I buy them when they have stuff I’m interested in, and/or when I want to support a particular designer’s work, but when you have an 800-item Ravelry queue like I do, it can take awhile to get around to everything! This pattern isn’t especially difficult, but like a lot of Cookie’s more architectural designs there are a lot of things to keep track of at once, and there are a few transitional moments where things can potentially get a little confusing. Lisa had to start over once, and I had to do significant ripping on the second sock when I forgot to stop decreasing for the gusset and the foot got stupidly narrow. But Knit.Sock.Love. 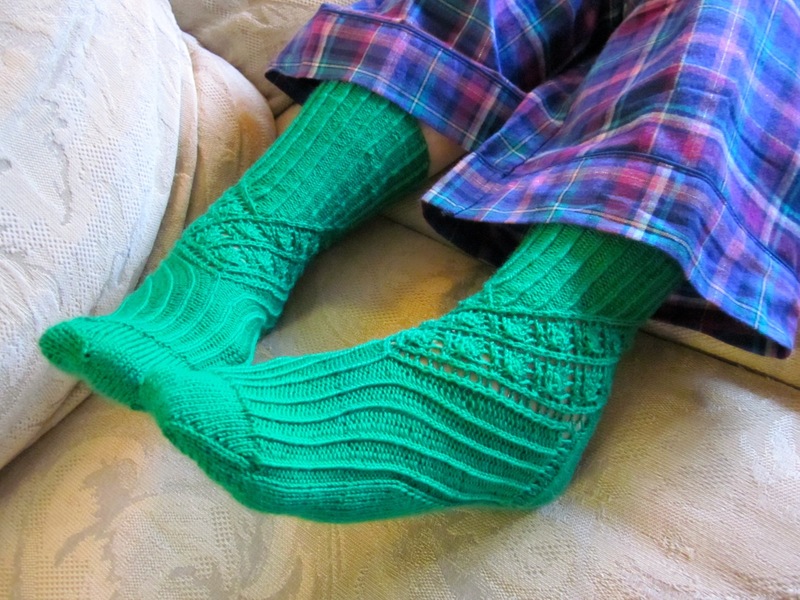 is full of genius diagrams to help you understand the construction of the sock and the way your various stitch patterns fit together, and the finished socks are quite lovely! I also think they’re faster to knit than an allover-patterned sock would be. I’ve fallen behind in my blogging again — I did finish that mystery KAL I was working on, though not quite by the Halloween deadline, but my pile of essays to grade has kept me away from the blog. I have a bit of a grading respite between now and the end of the semester, so I’ll try to get in an FO post for that mystery shawl, as well as a process-post about what I’m working on these days! See you again soon.